An Oscar nominated musical and alternative telling of the Cinderella fairytale. So its back to the 1970s for my latest review, a British retelling of the Cinderella tale named The Slipper and the Rose (1976). Cinderella herself is played sweetly and delightfully by Gemma Craven. Her Prince Charming – here named Prince Edward is Richard Chamberlain, in his pre-darling of the 1980s mini series days namely The Thorn Birds (1983) and Shogun (1980) and still basking in his The Towering Inferno (1974) glow. I always believed this musical film a surprising choice of film for Chamberlain. But then on reading more about him discovered he’d also released an LP in the 1960s. This film also sports a terribly 1970s supporting British cast including Margaret Lockwood (stepmother), Kenneth More (Lord High Chamberlain), Michael Hordern (The King) and Edith Evans (The King’s Mother). Other notable Brits include Sherrie Hewson (Palatine) and Annette Crosbie (Fairy Godmother). I have fond memories watching it on TV as a kid at Christmas, with my auntie who had a bit of a crush on the male lead, Richard Chamberlain from his days as Dr Kildare (1961-66). The story begins with Prince Edward (Chamberlain) of Euphrania returning home with his trusty sidekick John. He has been away meeting a far away princess who his family hope he will marry, but he doesn’t want to – for similar reasons to Henry VIII with Anne of Cleves in that she looks nothing like her portrait – and he bursts into song. Chamberlain tunefully complains about his wedding predicament, as he wants to marry for love not out of duty for one’s country. Prince Edward complains to everyone about his plight, particularly his father (Hordern) and mother. It is inferred they are victims of an arranged marriage as that’s how its done in Euphrania. And how it always shall be. Cinderella meanwhile has been to her father’s funeral and has returned home with her stepmother and her odious step sisters, Isobella and Palatine. Lockwood plays the villainous stepmother as evil personified, and is cold, cutting and scary. She is a fearsome character in her crimson dress mourning her dead husband. Cinderella is banished to work downstairs to take care of their household tasks. There is much hatred between these women. The reason for Prince Edward having to marry a princess is made clear, as the country is small, with war inevitable so the country must make an alliance with a neighbouring country. The Lord Chamberlain (More not Richard) then suggests a ball and to invite all the eligible ladies of near and far, where Prince Edward can choose a bride. This leads to more song. And dance and some very odd role-playing. Edward on hearing this idea, is upset about having to face the “cattle market” and sings about it. Meanwhile, Cinderella inadvertently met her fairy godmother. After the godmother finishes off the household chores with a flourish to save Cinderella’s skin with the upstairs evil ones, they become good friends. Cinderella’s step family then attend the ball. On hearing about the ball and Cinderella’s love for the Prince, her godmother magics Cinderella a lovely frock. After a bizarre wee ballet scene or two showing animals turn into people – but not in An American Werewolf in London (1981) sort of way. Cinders leaves for the ball in her golden carriage and sings on the way there. She enters the ballroom and she and Prince Edward fall for each other – Chamberlain, has one of those loved up looks Patrick Duffy did so well in Dallas (1978-92)- and dance like they are the only people in the world. I would sob more. But unfortunately they dance the same waltz from The Sound of Music (1965) and therefore that similar parodied scene in the parody Top Secret (1984) comes into my head. They walk, talk and snog. The Chamberlain appears and invites them to talk to the King, but its midnight. But she’s gone leaving her crystal slipper. Months, days and minutes later, Edward’s chum finds her again through chance and tells Edward. As Edward and Cinderella reconcile and I sob. After consent from her stepmother is given, they plan to wed. However the king is against this and asks the Chamberlain to speak with her, after which Cinderella leaves and is exiled and I sob more. So I suggest if you want to know if the film has a happy ending, you track down the film.. The film is a screen gem from start to finish. It is a lovely touch telling us more about Prince Edward, who in finding out more about him as a person, his hopes and desires and his clash with his family he feels like more than the cardboard cut out from many a Cinderella movie. Chamberlain, as a seventies heart-throb shines as the romantic lead, and is a pleasant singer and a nifty dancer. Craven is excellent in this her debut role, and in her final role Lockwood plays an excellent villainess. Her cutting comments still instil fear in me, as do her appearances during the film. Her reaction to Cinderella’s impending marriage is priceless as her face in seconds transforms of one of anger to one of insincere joy. Other notable mentions must include Hordern playing a bumbling King and More playing his Lord Chamberlain plays his character sympathetic to Cinderella’s love in a sensitive way. Annette Crosbie’s godmother is a wonderful character. She almost exasperated with her job and annoyed with her charges, Crosbie plays her to perfection. The film was produced by David Frost (and darlin’ husband reports the film is actually referred to in Frost / Nixon (2008)) and directed by Bryan Forbes. Bryan Forbes also directed International Velvet (1978) and The Stepford Wives (1975). Both films starred his wife Nanette Newman and as far as we know not her famous washing up liquid advert (which darlin’ husband proffered after I listed the first two). The musical numbers and dance routines are enthusiastically played throughout to the final scenes in which we meet the actors behind the parts almost like the end of a play curtain call which is a lovely touch. The costumes are magnificent, the setting is beautiful and soft focus used to dreamy effect. The story was also a refreshing and new slant on a well-known fairy tale for girls of all ages, all of which by the end of the film were rooting for Cinderella and Craven her happy ever after. 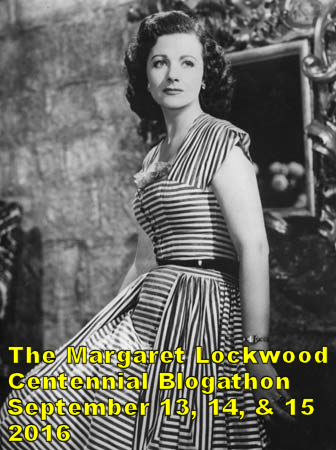 This review was entered as part of the Margaret Lockwood Blogathon run by A Shroud of Thoughts. Other reviews include Richard Chamberlain in The Swarm and The Towering Inferno. International Velvet was also directed by Bryan Forbes. Michael Hordern stars in Yellowbeard. Other musicals reviewed here include Rock of Ages and Mamma Mia! Hope you enjoy it when you watch it – love for you to return and tell me your thoughts when you do. If you check out the usual places there’s some more clips of him in this movie including the singing. I’ve always loved The Slipper and the Rose. There have been many re-tellings of Cinderella over the years, but it is one of the best. I love the fact that the Prince is a full blown character and not a cardboard cut out as in many of the versions of Cinderella, and Richard Chamberlain does play him wonderfully. And I love the Sherman Brothers’ songs–I’ve always thought they were underrated. Of course, Margaret does a great job as the Stepmother! It always made me happy to see she went out on a high note. Anyway, thank you so much for participating in the blogathon! If you like musicals and romance, this is one of the best. It is rich in settings and costumes, every actor is perfect in their part, and the music and dance is beautiful. Can you tell, I really like this movie? I thoroughly enjoyed your review. I almost forgot how much I liked this movie. But after reading your review, I think it is a must see movie at Christmas this year and future ones as well. Fantastic, Gill. That’s a Margaret Lockwood’s film I still need to see. But I will, of course, as I want to see all her films! Grand article on the film. I haven’t seen it in ages and I think the upcoming holidays just may be the right time to indulge.